The LYF has been broadcasting weekly farmer radio programmes since Autumn 2011. The radio programmes are delivering a significant impact. For example, smallholder farmers have already changed some of their practices in the cooperatives where the Farmer Field Listening Groups are operating – as a direct result of the farmer extension radio programmes. The first programmes covered the issue of the Coffee Calendar, Coffee Crop Varieties, Yields, Weather and Pest Resistant Crops. The programmes receive atleast 20 SMS messages after each broadcast. Most of the SMS asked about the Batian variety of coffee which was being marketed by the Coffee Research Institute (CRI) – a variety which is supposed to produce greater yields, better quality and which is pest and disease resistant – particularly in relation to Coffee Berry Disease and leaf rust. As a result of the content of the SMS messages received, we decided to re-schedule the broadcast and instead, prioritise an interview with the Director of the Coffee Research Institute which would focus on the Batian coffee variety. The Gikanda cooperative has purchased 2000 Batian trees and these are being planted by 50 farmers, with a further 8000 more being ordered. Rumukia cooperative has planted 30,000 batian trees and has ordered a further 30,000 trees. Due to these incredible increases it is anticipated that this will lead to higher yields and greater levels of resistance to disease and pests as a result. Gikanda Co-operative welcoming 205 new farmers for the last year – of which 103 are women. 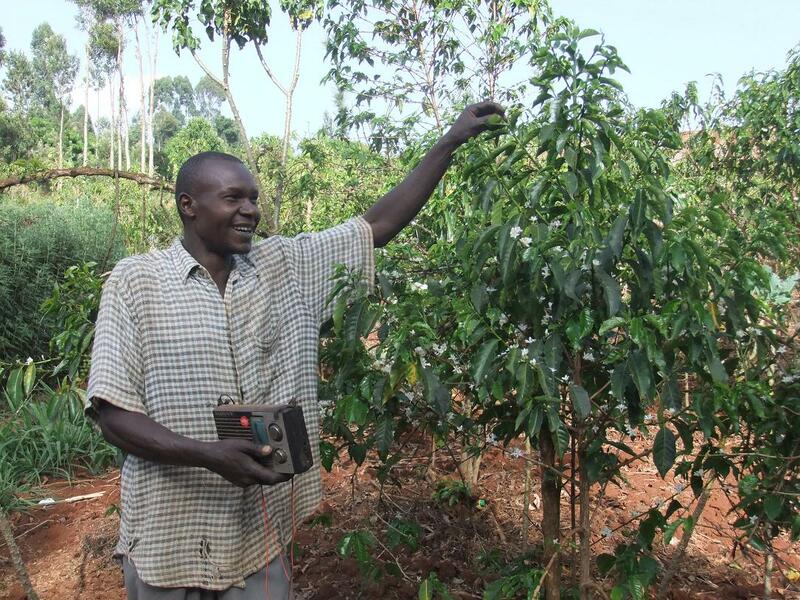 At Gikanda cooperative, production figures for the last financial year were 1 million Kgs of coffee. For this financial year, the figure has increased to 2.7 million Kgs. Rumukia cooperative produced 1.2 million Kgs for the last financial year and this year has reported that it has reached 3.7 million Kgs. Given that these remarkable achievements cannot be correlated solely by the increase in membership, the figures do point to an increase in production amongst existing members. It further suggests that greater transparency on pricing (i.e. pricing information is now being broadcast via the radio programmes) is leading to more smallholders wishing to become members of those cooperatives which are actively engaged in the farmer extension project. Coffee Management Services (CMS) which markets 34% of all coffee produced in Kenya – have confirmed to the LYF that as a direct result of the radio/ SMS initiative, the organisation has received an increase in interest in coffee farming, more coffee seedlings planting (of the Batian Variety), improvement in the implementation of Good Agricultural Practices, increased agro-input use in order to realise increased production and a visible increase in smallholder desire for better governance within the cooperatives. The information supplied from CMS has been further corroborated by statistics which the LYF has received from both Gikanda and Rumukia cooperatives which confirms that a marked increase in income for smallholders should be seen as a direct result of (increase productivity and volumes). Better education about, understanding, use and choice of Agro-Inputs (NB Agro-Inputs are items that are added to the ‘growing process’ – such as fertilisers and pesticides etc) This will lead to overall increased production of crops in the longer term. Demand for training from other coffee cooperatives beyond the Rumukia and Gikanda Farmer Field Listening Groups. The LYF has been informed that other coffee co-operatives in the region have been inundated with demand for information since the SSN Radio Broadcasts. We have been reliably informed that on aggregate, the other coffee cooperatives in the area have had to hire a further 8 agricultural extension field staff in order to meet the demand for coffee marketing, pricing and overall industry knowledge. This entry was written by Ian Agnew, posted on 26/07/2013 at 9:43 pm, filed under Farmer Extension Programme and tagged Africa, agriculture, coffee, coffee trade, fairtrade, farmer radio, Kenya, Lorna Young Foundation, LYF, smallholder, Trade not Aid. Bookmark the permalink. Follow any comments here with the RSS feed for this post. Post a comment or leave a trackback: Trackback URL.